For those of you following along in my blog, there is only one way to describe the difference from yesterday to today. "Night and day." Wow! It's really fun to watch myself improve so quickly! Class started off with my instructor asking questions on pre-trip inspections. As I've already stated, this is extremely important so they will drill this into our heads every morning until the day of our exam. We didn't do too bad, but still have some work to do. Aside from simply knowing what to do during a pre-trip inspection , we must have the wording memorized. I don't think this is necessarily a requirement during the test, but my school expects us to have the different steps memorized word for word. I'll trust their judgement and put in the extra study time. After our pre-trip (which took about an hour and a half), it was time to head back out to the trucks. But this time, we were going out on public roads. We still didn't have a trailer hooked up at first, but I was OK with that as I didn't feel like my shifting was up to par yet. What a difference a day makes though! I must have been dreaming about shifting last night because I was on the ball. I noticed my classmates were too. Everything just came so much easier and we were shifting much, much better than yesterday. I ended up driving for about 30 minutes and did very well. I did manage to mess up a couple shifts, but was able to recover on my own. I was with a different instructor today and he noticed something that I was doing. Instead of making direct shifts, I would tend to move the shifter around in neutral during my double-clutch. His theory was that this is what was throwing me off, forcing me to miss and grind gears. I got this habit from driving my personal vehicle. I have this habit where anytime the shifter is in neutral, I'll push the shifter back and forth. I guess it's just a way for me to ensure the car really is in neutral. This habit was playing a negative role on shifting the truck. It's much harder to "find" the gear after moving the shifter in neutral than it is in a car.When he told me I was doing that (which I didn't even realize I was), it definitely helped! I didn't grind or miss one shift after that for the rest of the day. My instructor even felt confident enough to take me into an area with a fairly steep downgrade (enough for signage warning trucks to use a low gear). I handled it perfectly. My downshifting is fantastic. For some reason this is one area I'm not having trouble with at all. I've heard that a lot of people really struggle with downshifting, but I just seem to do it very well, even to the point where the truck doesn't shift or jerk in the slightest. Very smooth. After driving almost all morning, we broke for lunch. After we relaxed for a while, my instructor broke us up into two groups. Four people would go to the "yard" to practice backing, and 3 of us would go with him to drive with a trailer attached! I was selected to go into the truck with the trailer attached. My gut was in my throat at this point. I felt I already had enough to concentrate on without pulling a small warehouse behind me, which could run over curbs, hit cars, pedestrians, posts, etc. However, while I don't mean to sound conceded, I really think he chose the best 3 to drive with the trailer first. The 3 of us, in my opinion, were the best drivers at that point. One of the students asked him flat out, more in a joking matter, "Did you choose us because we're the best?" After a long hesitation by my instructor, he finally responded with "I can't...you know..........no comment." I'll take that as a compliment! So anyway, I was the second guy to drive. Believe it or not, I actually thought it was easier driving with the trailer attached! Up-shifting can be a bit more difficult since you lose speed faster during the "double clutch" but I think the truck handled much better as a whole. My instructor was very adamant about us checking our mirrors during the turns. It's pretty sweet making that first turn and seeing the trailer go exactly where it needs to be! Man, what a feeling! For today, my instructor guided us through the right and left turns at intersections. We were required to drive with the wheel completely straight until he said "Now! ", then we had to crank the wheel. He gave us instruction through the entire turn and did a great job with us. It's a very awkward feeling driving into the intersection so far before turning the wheel. But I'm sure I'll get the hang of it after a little while. 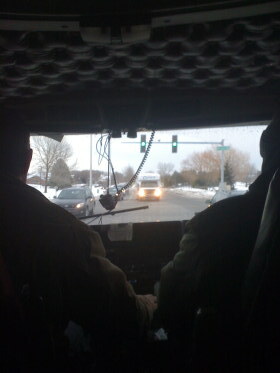 After all, this is only our second day driving the trucks and our first day out on public roads. I just can't get over the improvement that myself and all my classmates have made! Today was a definite confidence booster. One thing I've learned is that these trucks can sense fear. You think I'm kidding, but I'm not. As soon as you think you're about to make a mistake, it happens. As soon as you get a little flustered, you miss a gear. If you get a little scared of the truck, the upcoming turn, the next shift, etc., you will screw up. I'm trying to be as confident as I can driving, which is hard at times, but you must believe in yourself driving these things. Do whatever you can to relax yourself.This is one of the scariest things I've ever done. Talk about white knuckle driving! But at the same time it's the most fun I've had in a while.The emotions I'm feeling are truly hard to explain. But I'm feeling more confident every time I get into the drivers seat. I just need to be a little less tense when I'm driving tomorrow. It isn't doing me any good to be tensed up! Once we were done driving with the trailer, we spent a short time in "the yard" to practice on the course and practice backing the truck up. This is much easier to handle because there are only two gears to really worry about, first gear and reverse. It's all taken very slowly. Plus we're in an open parking lot. The only thing you're going to hit is a cone. And yes, I did hit a cone today. Whoops! I made a turn a little too tight and flattened the poor little orange guy. My first experience backing up on a 45 degree angle I did pretty well though! 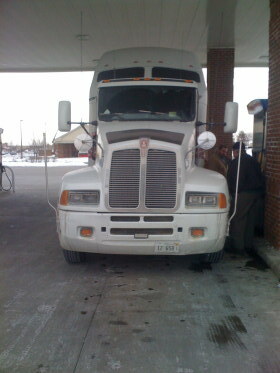 The first time I backed it in, I was a bit crooked so I had to pull up a bit. But then I was able to get it right in between the cones. Unfortunately, we were out of time pretty quickly after I was able to drive the truck around the yard, so I only got to do the course once. But I feel with a bit of practice, I can get backing down pretty well. We shall see! Tomorrow, we will spend the entire day rotating between the road trucks and the yard trucks. I'll be sure to update you with my new experiences!